Venue: G4S London Headquarters, Southside, 105 Victoria Street, London, SW1E 6QT. Protests will create military checkpoint outside G4S headquarters to protest over G4S participation in illegal detainment and torture of Palestinians in Israel. Protestors will dress up in military fatigue and will be carrying oversized paper mache guns to illustrate the draconian actions of Israel and G4S complicity. G4S continues to be listed on the London Stock Exchange and is adversely affecting the reputation of British business abroad as well as the high corporate ethical standards. 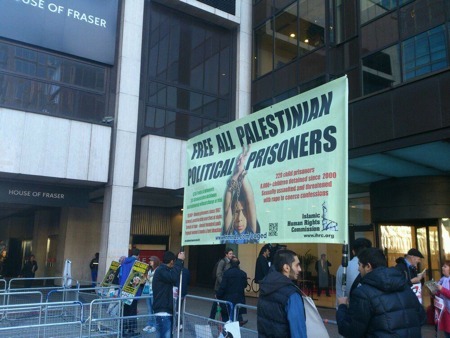 Islamic Human Rights Commission has been holding fortnightly protests outside the G4S Headquarters and other locations to protest G4S’ complicity in sustaining Israel’s torture dens.